Gaspari Pedrelli Family is very pleased to welcome guests to Eiffel Hotel, which is idyllically located in a central position situated 30 metres far from the sea. Air-conditioned throughout, it offers guests high-quality services and facilities. 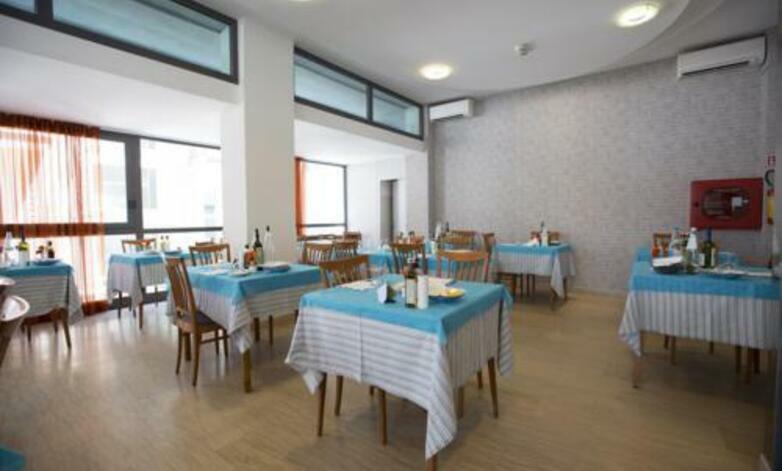 Eiffel Hotel is idyllically located in a central position situated 30 metres far from the sea. It offers guests high-quality services and facilities, and is provided with lift, large air-conditioned restaurant room, TV room with Satellite TV and large solarium equipped with beach mattresses which gives guests the possibility to undergo heliotherapy while enjoying breathtaking views over the Adriatic Coast. Tennis courts are situated 250 metres far from the hotel. All bedrooms are provided with private services, balcony, direct-dial telephone, safe, TV and air conditioning (free of charge). Gaspari Pedrelli Family welcomes guests with utmost kindness and hospitality, and gives them the possibility to taste both traditional specialities from Romagna and nouvelle cuisine and to take part in amazing evening parties. Choice fish and meat menus every day, rich buffet-style breakfast and rich buffets based on starters and vegetables both at lunch and dinner. Beach facilities: bathing huts, entertainment, baby garden, bocce court, fitness and aerobics courses.